On a busy night in early January, Jared Daniels-Block's Gateway Fighting Series will come bursting through the door with its first ever arena event. 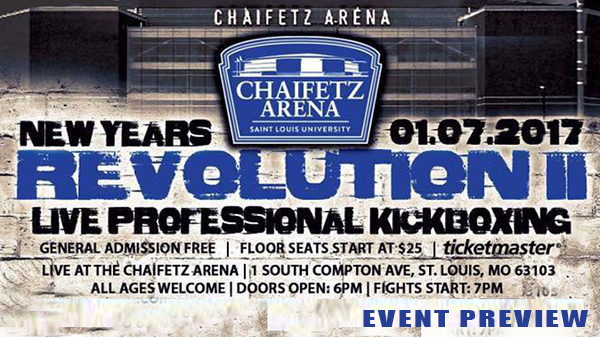 Leaving the friendly confines of the Heart of St. Charles, GFS will set up shop inside the spacious Chaifetz Arena in downtown St. Louis for "New Years Revolution 2". Home of the St. Louis Billikens, the 10,000 seat Chaifetz Arena is in the heart of the campus of St. Louis University and is no stranger to MMA having hosted the AMMO Charity event three years ago. Gateway Fighting will be looking to lure in the crowds offering free general admission tickets to anyone within earshot, and if you haven't picked up your tickets already, they will be available at the door at no charge. This model of free admission has proven to be successful for Fight Hard MMA which coincidentally, will also be hosting an event on January 7th. With so much free K1 and MMA on one night, it will be interesting to see where the crowds turn up. Headlining the event is Elmir Kulosman taking on KJ Jones. After a successful debut, Kulosman was stopped by Darryl Cobb with a nasty kick to the perplexes this past June at Bellator. Jones will be making his jump to the pros after winning in his return to action in September. Kulosman will have a much more technical and well-rounded game, but Jones isn't the type that backs down from a challenge. If Jones can stay outside and avoid Kulosman's clinch game, he has a decent shot. Speaking off Cobb, "Devastatin" Darryl will join Kulosman on the main card when he faces Scott Futrell. Futrell will be an intriguing match-up for Cobb who has more experience in striking competitions but will be giving up a sizable amount of reach. Futrell has nasty straight punches and a surprising amount of power given his tall, skinny frame. Cobb will need to stay active and work the kicks on Futrell, while Futrell will look to establish control of the middle of the ring and work his jab. Returning to action for the first time since UFC 187, Josh Sampo laces up the gloves once again. Looking to dip his toes back into the competitive scene, Sampo will face Tyger Banks in a K1 affair. Sampo was forced off the RFA 43 show in September with the flu and by all accounts is eager to get back into action. Awaiting Sampo in his return is Cincinnati's Tyger Banks, a hard-punching flyweight with traditional Muay Thai experience. Skilled striker from Modern Combat Systems, Montrell James returns. James turned professional late last year with a boxing and kickboxing match, but has yet to taste that first victory. Taking on James is Bryan Carrol fighting out of Kansas City's Cavemen Crew. Rounding out the main card is a match-up between Henry "Rome" Lindsey and one of the most active St. Louis fighters last year, Luis Pena. Pena, out of St. Charles MMA, is 2-0 as a professional with a win at last year's Golden Gloves, and a KO of the Year nomination to his cred. Kansas' Lindsey is big and tough and was originally scheduled to take on Pena's teammate Jimmy Donahue who was forced off the card with an injury. Five amateur K1 bouts make up the undercard headlined by the always exciting and fun to watch Drew Gigax. Gigax - out of Andre's Academy and teammates with Cobb - is one of the best amateur strikers in the area and will take on Grayson Culbreth. Local promoter Beejay Smith will step out from behind the scenes to face Sam Stevenor. Smith has been getting in rounds with Kirk Huff and his team at Arnold BJJ. Stevenor will realize the dream of many local amateurs when he gets the opportunity to punch a fight promoter in the face. 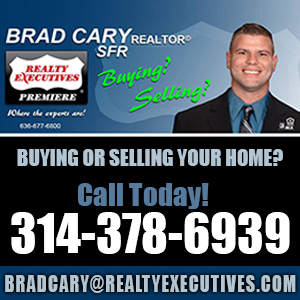 If you're a long-time fan of St. Louis MMA this fight is worth the drive to Chaifetz. Prior to the undercard will be a set of amateur MMA bouts headlined by Steven Coleman and Corbin Howard. Howard, the younger brother of signed Bellator fighter Jordan Howard, is a dynamo and has looked incredible in his first three bouts. He'll take a giant leap forward in competition when he faces Coleman who has been nearly flawless with a 10-2 record but is rebounding from a nasty KO in September. Also on the card is Wolves Den's Raja Singh taking on Dylan McCollum, as well as young female prospect Izzy Robinson, who takes on Katelyn Jesse in MMA.